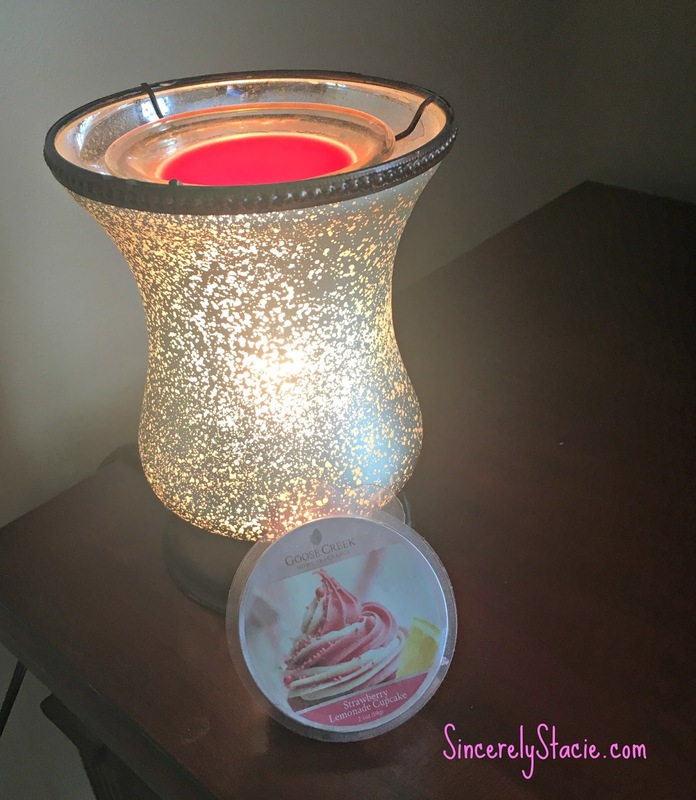 I love using scented wax to make our home smell wonderful. I have a habit of forgetting to blow out candles so I like using these because they are much safer and when I leave, I just turn them off like I do the rest of my lights. If you have never used a scented wax before, you can purchase a wax burner from many department or discount stores. Then you break off a piece or two of the wax and place it on the burner. 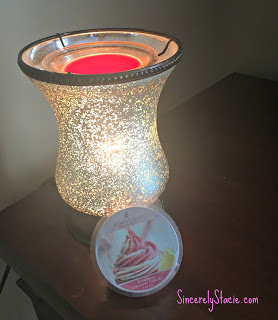 The light bulb in your burner will heat up the wax and melt it which then gives off the scent in the room.When you turn off the warmer, the wax will reharden and be ready for the next time you want to melt it. Goose Creek wax melts are long lasting, with the potential to burn 50-80 hours per package. They are made with natural essential oils that give that true-to-life scent. 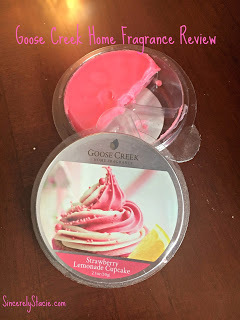 I was able to try the Strawberry Lemonade Cupcake scent which was a perfect summer scent. I tend to like food or citrus-related scents in our home and this one was just the kind of scent I like. My husband thought it was a bit too sweet, but I really liked it. Several times while the wax was burning, someone would ask, “Are you baking cupcakes?”. This would make a great scent for staging your home if you are putting your house on the market. I’ve always heard that having the scent of something baking makes people more interested in buying your home. Since we were doing construction on our home all summer, I used this warmer in various locations in our home. But, it was nice to turn it on during the evening to get some of the odors from construction out of the house. I used half of the package of the wax melts since I have a larger warmer. I can’t tell you how many hours I have used this, but I’m sure it is much less than the minimum of 50 hours for the length of use. There is still plenty of scent left in the wax when I turn it on and I can smell it throughout my whole home, not just in that area where the warmer is placed. Goose Creek offers a number of products in their home fragrance line. Finding a scent that works for your home will be easy with their variety of fragrances. Thanks to Goose Creek for sending this product for the purpose of this review. This review is my honest opinion. I was not compensated in any way for this review. If you choose to purchase this product through the above link, I may receive a small commission without you having to pay a cent more for your purchase. Thanks for supporting SincerelyStacie.com.